Damascus (AFP) - Israel's military said it carried out strikes on Iranian targets in Syria early Monday after it intercepted a rocket fired from Syrian territory hours before. It said in a statement it was "currently striking" the Iranian Revolutionary Guards' Quds Force in Syria and warned Syria's military against "attempting to harm Israeli territory or forces". It provided no further details on the raids. Israel's military said on Sunday its air defence systems intercepted a rocket fired from Syria, after Damascus accused Israel of carrying out air raids in the country's south. As Israel announced its strikes early Monday, Syrian state news agency SANA said its country's air-defence systems had targeted "enemy" fire. The Syrian Observatory for Human Rights war monitor reported Israeli missile strikes in the area of the Damascus airport and areas around the capital. It said the missiles hit apparent Iranian and Hezbollah arms depots. 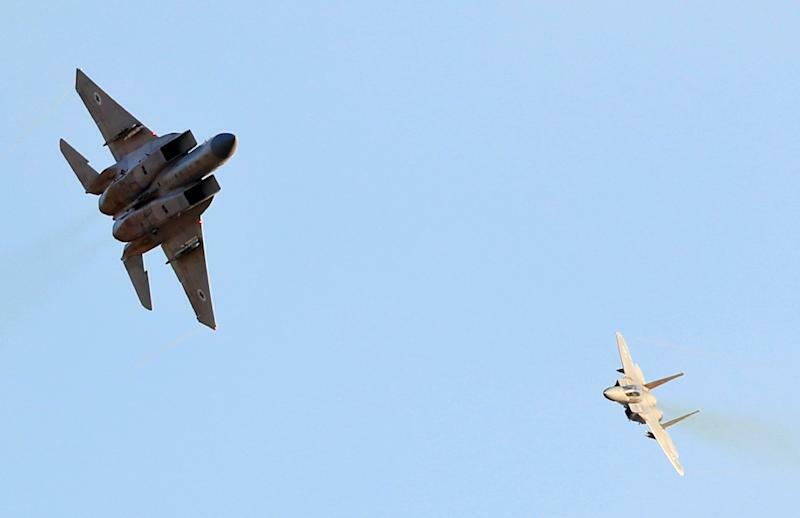 It has carried out hundreds of air strikes there against what it says are Iranian military targets and advanced arms deliveries to Tehran-backed Hezbollah, the Lebanese Shiite militia. Israel rarely publicly confirms its strikes in Syria. Its fighter planes have faced anti-aircraft fire during such raids, but Israeli media reported that Sunday's response included a surface-to-surface missile from Syria. Israel's military said only that it had intercepted a rocket fired at the northern Golan Heights. On Sunday, SANA quoted a military source saying Syria's air defences went into action after Israel earlier in the day launched air strikes on the south of the country. The Russian army said Syrian air defences destroyed seven Israeli projectiles, after four of the Jewish state's F-16 military planes "fired rockets into Syrian territory". Israeli Prime Minister Benjamin Netanyahu told reporters on Sunday that "we have a permanent policy: to strike at the Iranian entrenchment in Syria and hurt whoever tries to hurt us." Netanyahu and other Israeli officials have been speaking more openly about the Syria strikes in recent days, with some analysts saying the premier seems to want to further burnish his security credentials ahead of April 9 elections. But Israel also risks an escalation with Syria and Iran, as well as possibly further angering Russia. Military coordination between Israel and Russia took a hit after a friendly fire incident in September that led to a Russian plane being downed by Syrian air defences during an Israeli strike. The incident angered Russia and complicated Israel's operations in Syria, particularly after Moscow's delivery of the advanced S-300 air defence system there in response. Israel has sought to keep its coordination with Russia on track and maintain its ability to strike in Syria. On Thursday, Israeli military officials concluded a series of talks with their Russian counterparts aimed at improving coordination in the war-torn country. Both Russia and Iran are backing Syrian President Bashar al-Assad's regime in his country's civil war.